From the time of the cave men, all the way until today, humanity continues to exist because each generation of people has produced another generation to replace itself. Scientist have figured out how many people need to be born each generation to replace the generation before. That number is one person per person. All things being equal, this creates perfect demographic balance. Since women are the only ones who can have children, replacing every person on Earth means each woman needs to have two children: one to replace her and the other to replace the man, who cannot have children. The total total fertility rate is the average number of children each woman in society is having. This number shows us that the society is growing or shrinking. Not really. The number that shows us if a society is growing or shrinking is called the growth rate. Total Fertility Rate tells us how many offspring an average woman has in her lifetime. Conflating these two statistics, as this episode does, prevents us from understanding what is really happening with human population today. In developed countries, the replacement rate birth rate is two point one children per woman. This will keep the population stable. This would keep population density stable if previous generations hadn’t bred at much greater rates—which they did. But even that is assuming that every woman has children and that there are no wars, famines, or disease. In the real world, disasters happen all the time and sadly not all children reach adulthood, especially in poor countries. This pushes their replacement rate up to three point three children per woman. This discrepancy shows one of the reasons fertility rates can’t be used to determine growth rates. Since not every woman wants to have children, in order to keep the population stable, some women need to have more than two point one children to balance the birth rate with women who are only having one or no children at all. TFR is an average of the total female population of reproductive age, so by definition some women will have more and some fewer. Keeping “the population stable” is something else entirely. Maintaining this balance is of the utmost importance. If society does not at least replace itself every generation, human numbers begin to fall exponentially. “Exponentially” in this case implies an accelerating change. Population change is compounded over time by increasing or decreasing birth rates. 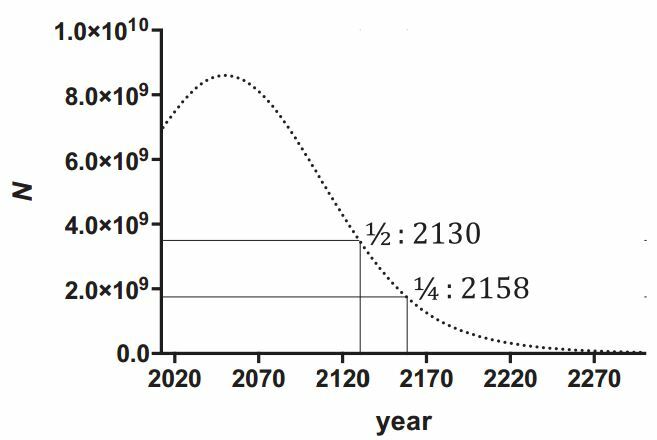 A small decrease in global fertility now will greatly affect global population density decades from now: between 8 billion and 10.5 billion people are projected for later in this century. It takes longer to decrease population density by lowering fertility than to increase it because once people are born they’re here until they die, which will hopefully be at the end of a healthy and happy lifetime. A fertility rate below 2.1 eventually brings about a smaller population, but when people have been breeding at a much higher rate, it takes a long time just to achieve stability. 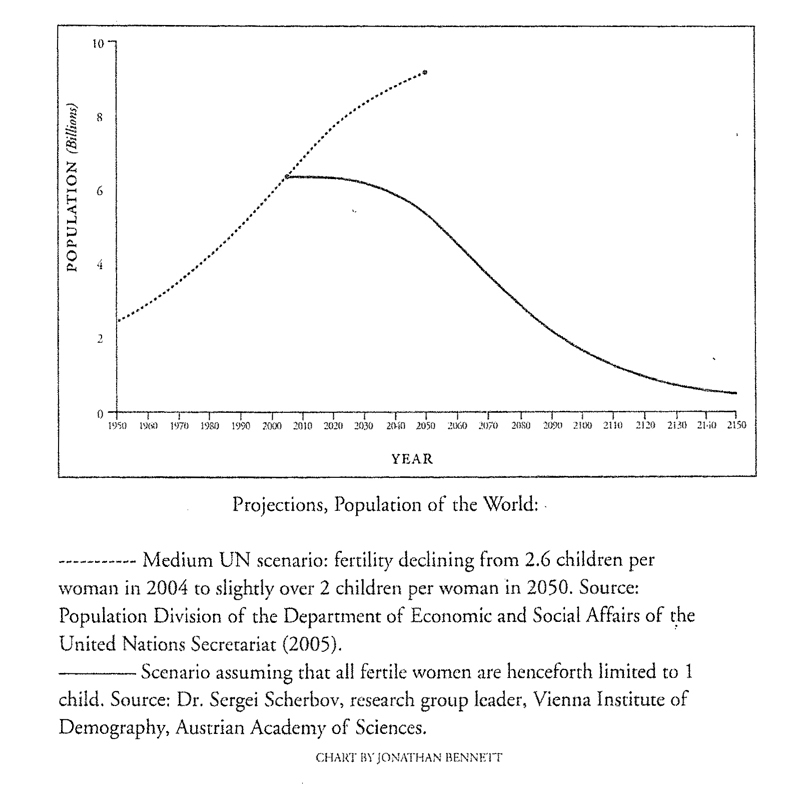 In 1950, global fertility was about 5.0 and we were increasing by around 35 million per year. Today, fertility has dropped to half of that: 2.5. However, we are increasing by 76 million per year: more than twice the growth with half the fertility. Economic and social problems appear, as elderly people retiring begin to outnumber young people entering the work place. And this is already happening all over the developed world. Our economic systems are artificial and could be adjusted to accommodate a shrinking work force, if that ever happens. Unemployment figures reveal that breeding more workers won’t automatically generate more income taxes. We’ll just have to imagine what social problems will be caused by a higher proportion of mature and experienced workers in the work place. Many of the world’s nations are only barely replacing themselves. While the growing majority have birth rates below replacement, some as low as one point eight or one point two babies per woman. The 38 nations with a shrinking population constitute less than 10 percent of the world’s population. Some of these nations are losing population through out-migration, which has no effect on total population. In 2011, 104 of the world’s 224 nations had birth rates less than “replacement level” of 2.1 and 120 were at or above. However, the number of nations is irrelevant: China has 1.3 billion people and Pitcarin Island has 48. Both nations have fertility rates below replacement level, but one grows by 6.6 million each year and the other is rather stable. Many societies are facing a very real danger, extinction. Japan’s excessive population density is holding steady with slight decreases and increases over the past few years—nothing that could remotely be called a demographic collapse. 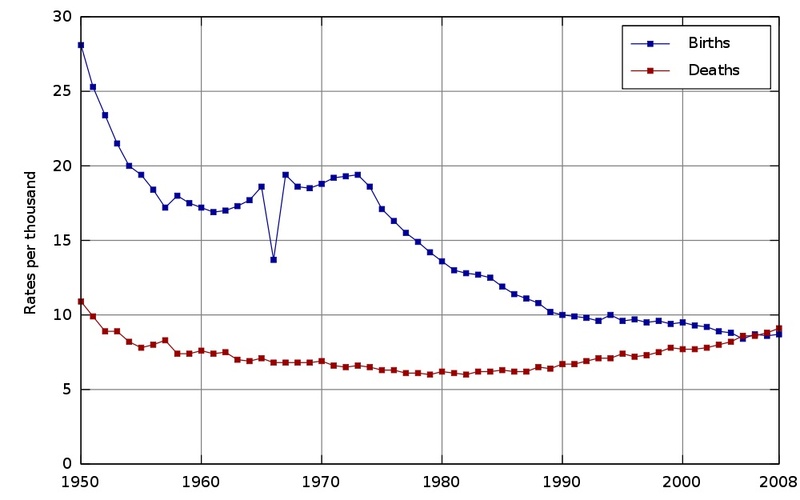 Comparing rates of births and deaths gives a more accurate picture of what’s happening to Japan’s population. Japan’s 127 million residents shrank by a quarter of a million in 2013: 0.2%. Having exceeded the carrying capacity of their islands by 560%, a “demographic collapse” could greatly benefit the Japanese people and the ecosystems they draw resources from. We could accurately say, “dramatic reductions in fertility of developed countries have occurred in the past,” but not dramatic reductions in population. As noted above, only 600 million of us live where human population density is improving. Considering the disproportionate impact which people in “developed countries” create, dramatic reductions there would ease impacts on Earth’s biosphere much more than in “undeveloped countries”. Elderly people’s ability to support themselves is greatly underestimated. True, many elders are forced to rely on offspring for support, but in societies where their wisdom and advice are respected, they continue to contribute to their family’s well being and thus are supporting themselves. Fear of a lack of adequate income and health care during retirement causes many to breed potential caregivers: social security for the poor. In wealthier countries, the elderly support themselves by drawing pensions and social security which they paid into over 40 to 50 years of working. Many continue earning an income and paying taxes during much of their latter 20 years of life, while those in the first 20 years are unable to support themselves and are an economic drain on societies. Debate over Social Security in the US is driven by political ideology and doesn’t portend “a catastrophic collapse.” This “setup” is funded by taxes on incomes, which are reduced more by automation, outsourcing jobs, and lower wages than by a shortage of workers. A society which chooses to provide for their needy elders will find ways to fund support. High infant and child mortality rates are the result of high fertility rates. Fertility doesn’t need to be higher to offset those losses, it needs to be lower to avoid those losses. Parents are unable to provide for as many offspring as they produce, and often are denied access to adequate methods of contraception. Would that it were so simple. When a population decreases in size, the number of potential mothers also decreases. We say that countries with very low birthrates—like Japan’s 1.21 children per woman—are in demographic collapse because each new generation is little more than half the size of the one that preceded it. 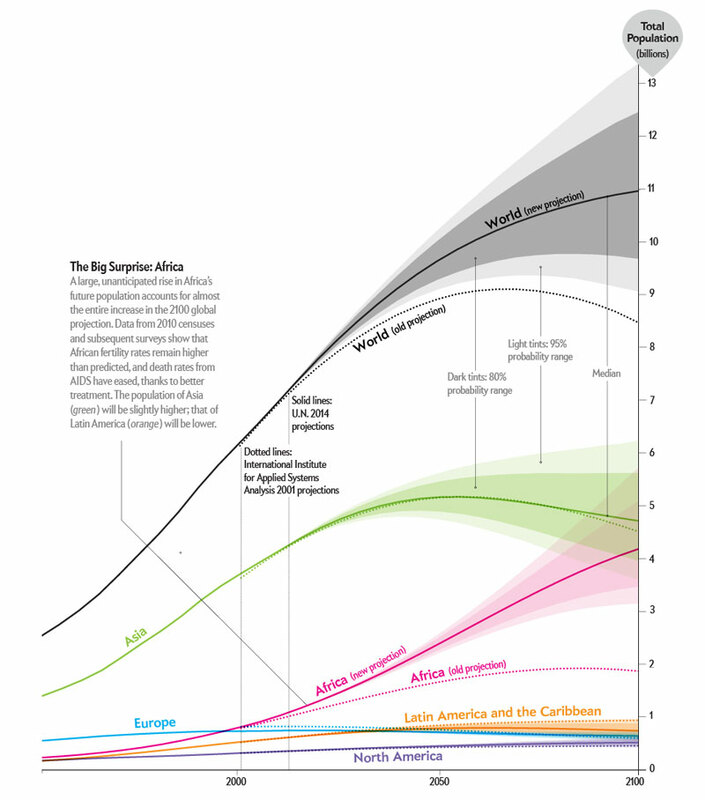 At this rate, it would take only four generations to reduce the size of population to 10 percent of its initial size. To offset this decline and restore the population to its initial numbers, each woman would need to have 20 children! Hardly a tenable solution. Fortunately, future generations won’t need more people any more than we do. A computer projection revealed that an imagined TFR of 1.0 starting in 2004 would reduce population to 25 percent of its initial size by 2100: from 6.5 to 1.6 billion in 96 years. A 2014 computer projection of a global 1.0 TFR is less optimistic, with approximately five billion of us in 2100. Meanwhile, fertility rates in the real world are projected to increase our population to between eight and 10 billion by 2100, according to the UN.